Newport Harbor Orchid Society Monthly Meeting We meet on the second Tuesday of each month at the Senior Center in Costa Mesa, 695 W. 19th Street. The meeting begins with a culture class (topic related to orchid culture) from 7:00-7:45 p.m., followed by the general meeting at 7:45 p.m. which features a speaker (topics range on various orchids), ribbon judging, plant display, refreshments, a silent auction, and plant raffle. Please refer to our Newsletter for the latest NHOS Info. 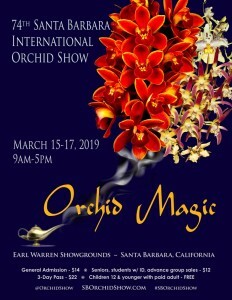 SDCOS International Spring Show Our International Spring Show dates are March 22nd, 23rd,& 24th, 2019. Doors will open 3 pm Friday, 9 am Saturday and 10:00AM on Sunday. Here's the google map showing the Show location and convenient free parking: Scottish Rite Center. Admission is $10.00 daily or $12.00 for a weekend pass. Norman's Orchids' 10,000 sq. 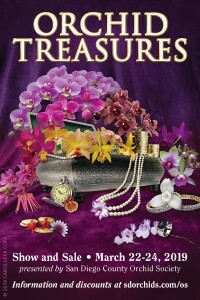 ft showroom has thousands of orchids in bloom and all necessary supplies. 11039 Monte Vista Ave, Montclair, CA. 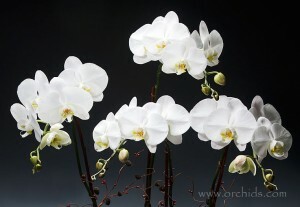 Buy any five orchids, get one free. More information: 909-627-9515. Newport Harbor Orchid Society Monthly Meeting We meet on the second Tuesday of each month at the Neighborhood Community Center in Costa Mesa, 1845 Park Avenue. The meeting begins with a culture class (topic related to orchid culture) from 7:00-7:45 p.m., followed by the general meeting at 7:45 p.m. which features a speaker (topics range on various orchids), ribbon judging, plant display, refreshments, a silent auction, and plant raffle. Please refer to our Newsletter for the latest NHOS Info. 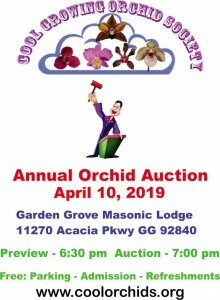 April 10, 2019 Preview: 6:30 pm Auction: 7:00 pm Garden Grove Masonic Lodge 11270 Acacia Pkwy, Garden Grove, CA 92840. 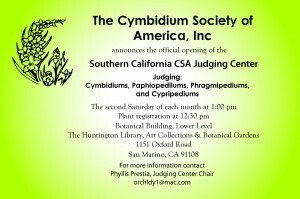 Southern California CSA Judging Center Judging Cymbidiums, Paphiopedilums, Phragmipediums, and Cypripediums. The Huntington Botanical Gardens, Botanical Building, Lower Level at 1:00 pm on the second Saturday of each month. Plant registration at 12:30 pm. 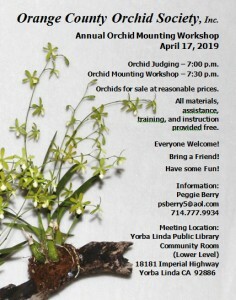 Orange County Orchid Society's Mounting Workshop Wednesday, April 17, 2019 7:00 pm - Orchid Judging 7:30 pm - Orchid Mounting Workshop Location: Yorba Linda Public Library, Community Room (Lower Level) 18181 Imperial Highway, Yorba Linda, CA 92886 Orchids for sale at reasonable prices. All materials, assistance, and instruction provided free. Everyone Welcome! Bring a friend!